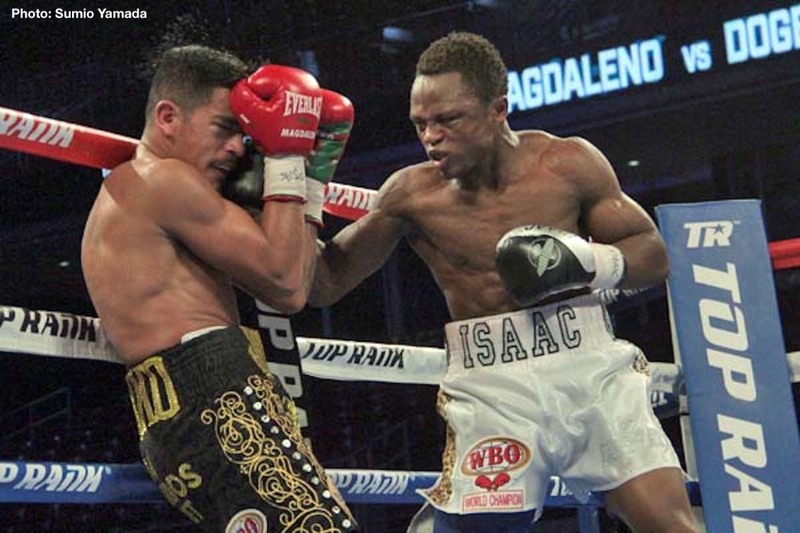 Ghana’s Isaac ‘Royal Storm’ Dogboe is the new WBO junior featherweight champion of the world following a convincing come-from-behind TKO victory over hitherto undefeated titlist, Jessie Magdaleno of the USA Saturday night in Philadelphia, Pennsylvania. Dogboe suffered a knockdown in the very first round, the first time he had gone down in his career but it also proved a wake-up call as the young Ghanaian got up and dominated the rest of the fight including also sending Magdaleno down to the canvas for the first in his career too in round 5. Dogboe took control of all subsequent rounds, tutoring the elderly and more experienced Magdaleno some tough rudiments of the pugilustic sport much to the admiration of the ringside crowd at the Liacouras Centre inside the Temple University campus in Philadelphia. After briefly getting back into the fight in round 9, the countdown to the end for Magdaleno began in round 10 when Dogboe caught him with a barrage of shots to the body and head, his legs looked wobbly but he held on to finish what was another big round for the 23 year old from Ghana. Magdaleno could not run any longer and his doom came early in the 11th round as Dogboe went all out and quickly caught his opponent with another power shot that sent Magdaleno down to the canvas for the second time on the night. He managed to get back on his feet but the unwavering Dogboe moved on him again and rained more punches on the Mexican-American who finally went down again from another powerful left hook of the Ghanaian. He failed to beat the count and the referee called it off at 1:38 of the round 11 of course. The undefeated Ghanaian who was leading on all three scorecards before the stoppage, improved to 19-0, 13 KOs whilst condemning Magdaleno (now 25-1, 18 KOs) to the first defeat of his career. Dogboe by the victory also becomes Ghana’s 8th boxing world champion and the youngest to ever do it, beating by over a year the previous record held for nearly 24 years by the renowned hard hitting Ike ‘Bazooka’ Quartey who defeated Crisanto Espana to win the WBA welterweight belt in June 1994 when he was still chasing his 25th birthday.